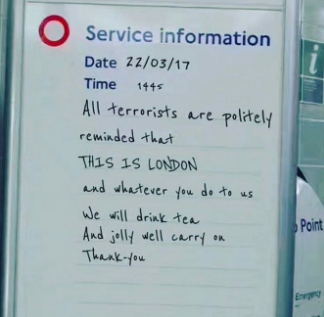 Following the Westminster attack, people began sharing a fake London underground service sign. On Wednesday, a terror attack in the London borough of Westminster left at least four people dead. Following the attack, an image of a London underground sign began to circulate on Twitter. 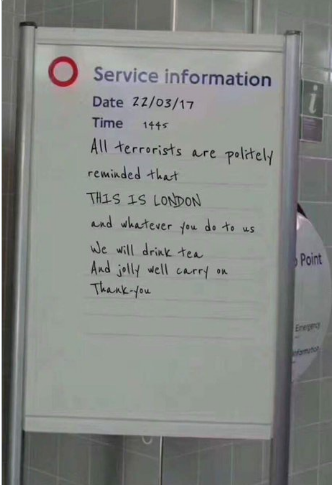 The sign, which appeared to be from Wednesday, was addressed to "all terrorists", reminding them that "THIS IS LONDON", and that Londoners "will drink tea and jolly well carry on". The sign was even referenced in parliament, with prime minister Theresa May calling it a "wonderful tribute." However, immediately after the sign was shared, it was quickly shown to be fake. Firstly, the time and date on the sign suggests it was written at 2.45pm on Wednesday, minutes after the attack was reported to have happened and little information had emerged. The writing on the sign appears to be typed rather than handwritten – there's no inconsistency between repeated letters. And there appears to be only one photo of the sign circulating on Twitter. The sign appears to have been created using an online generator. In response, some people began making their own humorous versions of the fake sign. You can follow live updates about the attack here.